"For, Lo! We live in an Iron Age--In the age of Steam and Fire!" wrote a poet mesmerized by the engines that were transforming American transportation, agriculture, and industry during his lifetime. Indeed, by the nineteenth century fire had become America's leitmotif--for good and for ill. "Keeping the flame" was deadly serious: even the slightest lapse of attention could convert a fire from friendly ally to ravaging destroyer. 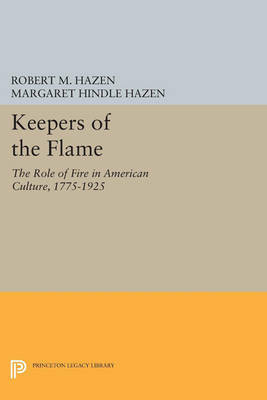 To examine the cultural context of fire in "combustible America," Margaret Hazen and Robert Hazen gather more than a hundred illustrations, most never before published, together with anecdotes and information from hundreds of original sources, including newspapers, diaries, company records, popular fiction, art, and music. What results is an immensely entertaining and encyclopedic history that ranges from stories of the tragic "great fires" of the century to fire imagery in folktales and popular literature. Dealing more with technology than with fire in nature, the book provides a vast amount of information on fire manipulation and prevention in urban life. Hazen and Hazen discuss the people who worked with fire--or against it. Founders, gaffers, blacksmiths, boilers at saltworks, and housewives knew how to "read" a fire and employ it for their purposes. A few dedicated investigators inquired about the scientific nature of heat and flame. And firefighters gradually progressed from "bucket brigades" to "using fire to fight fire" with the newly invented steam engine. The colorful stories of these Americans--the risks they took and the rewards they received--will fascinate not only social historians but also a broad audience of general readers. Originally published in 1992. The Princeton Legacy Library uses the latest print-on-demand technology to again make available previously out-of-print books from the distinguished backlist of Princeton University Press. These editions preserve the original texts of these important books while presenting them in durable paperback and hardcover editions. The goal of the Princeton Legacy Library is to vastly increase access to the rich scholarly heritage found in the thousands of books published by Princeton University Press since its founding in 1905.